There is a word for everything you see and do every day. Picture dictionaries are fine, but the things you see and touch everyday are your world, and they are the things you should be able to name and talk about. Look at yourself. What are you wearing? I have on blue jeans and a t-shirt today. When I go to work I still wear blue jeans, but I put on a button down collared shirt. I’m starting to wear socks every day because it is getting cold outside. I don’t use a wallet, so I always have some paper money and a credit card in my pocket.I have a wedding ring on my finger and a bracelet I bought in Nepal 30 years ago on my wrist. When I wrote this I was holding a pen in my hand. That’s a lot better than a picture dictionary, isn’t it? 1 Make a list in the pocket of the things in your pocket. 2 Make a list in the hand of the things in your hand. 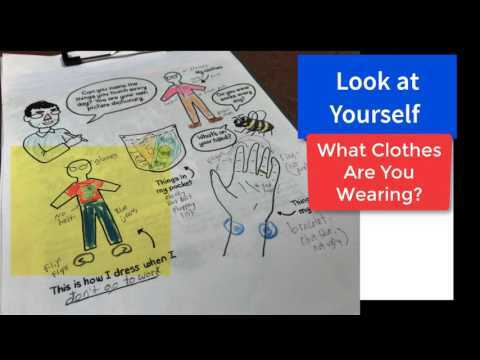 3 Draw the clothes you are wearing today. 4 Draw clothes you wear on a special occasion. We should be able to talk about the things we see and touch every day. And we won’t forget them, because we see and touch them every day. Start with yourself, your clothes,. Then you can expand your view and your vocabulary wider and wider.